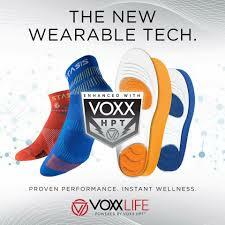 Wear the Voxx HPT for 24 hours everyday to experience full benefits. ​​Performance: Voxx HPT has been tested and proven to increase range of motion, endurance/recovery, balance & stability, and energy & performance. These benefits are almost immediate when putting on this technology. However, it may not be noticed/felt until you compare what your body is able to do while wearing the technology and without. For athletes, this may mean comparing your performance in a workout while wearing the technology and without. ​Pain Relief and Wellness: These products have also been studied and shown to reduce foot pain including Plantar Fasciitis & Diabetic Neuropathy. Thousands of people have shared testimonials of improvements in their overall health and wellness including those with a wide range of physical health challenges. Some notice an immediate difference, others notice subtle improvements over time, and some experience both an initial and gradual improvement. Those with health challenges will likely continue to have up-and-down days; this is not a reflection on how well the technology is working. ​Use: Wearing the product as much as possible. 24 hours a day/daily for a few weeks will provide you with the best sense of how you will experience this technology and provide the greatest results. Then, if you remove the technology for a few days, you may notice the return of some symptoms you had not even noticed had disappeared/lessened when you were wearing these products. Some people may have an adjustment period*​ and need to wear the product for a shorter period of time at first and increase the time they are wearing the technology as their body adjusts. Hand or machine wash inside out in cold or warm water and air dry. You may find that the wicking and antimicrobial properties of the socks allow you to wear them more than one day at a time between washings. Cut tags off to prevent premature holes. ​DO NOT use bleach, dry clean, iron or machine dry. ​Classic Insole Care: Cut to fit - Avoid cutting the oval thumbprint area, this will void warranty. Use a mild soap to hand or machine wash, air dry. ​Bella/Bello SLIM Insole Care: Cut from the toe and/or heel to fit. Keep thumbprint pattern at the ball of the foot. Avoid cutting into the oval pattern. Any cuts to the pattern or vertical from the edge (to fit flip flops) will void warranty. The insoles may be attached in sandals or shoes with an adhesive of your choice (glue dots, double sided tape, etc.) but this is your decision and responsibility. Harmony Neuro Patch - How to apply: FIRST TIME WEAR - The patch should be placed on your dominant forearm, centered between your wrist and elbow. This is your activation point and will always be the most effective placement. Make sure the area is clean, dry, and free of any oils or lotions. Wiping with alcohol is advised. Apply at room temperature and cover it with your hand and press for a few seconds. Your patch is designed to last 24 hours ONLY. It is waterproof and medical grade with NO chemicals. Once The first 24 hour activation is done, you MAY be able to apply a new patch in other places. Have someone do a Voxx Demo to check efficacy. • Reduction in physical discomfort is most commonly observed after 2 weeks of continuous 24/7 wear. Interested in doing additional research? * Most users feel nearly immediate improvements and benefits from using Voxx Human Performance Technology (HPT). However, on occasion, some users may go though an adjustment period. An adjustment period may last a few hours, a few days or even a few weeks.